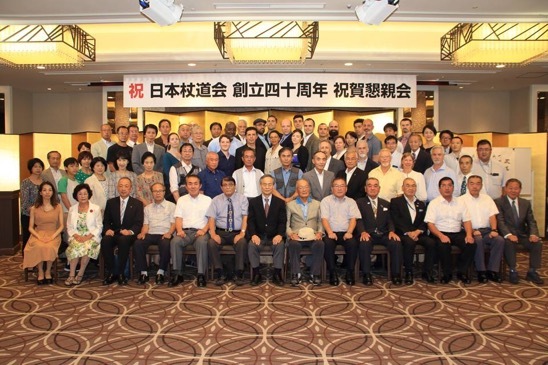 Nihon Jodokai 40th Anniversary banquet, August 2018. 18 jodoka from the North American group travelled to Japan to train for a week and join in the celebration. Welcome to the website for the Capital Area Jodokai and Rose City Shindokai. We study jojutsu, the way of the stick, as directly taught by Kaminoda Tsunemori Sensei and as practiced by his successors at the Nihon Jodokai. The CAJ practices Saturday (11-1:30 pm) & Tuesday (7-9pm) at 25 S. Quaker Lane, Alexandria VA. The Rose City Shindokai practices on Wednesday evenings at the Portland Community of Christ Church at 4837 NE Crouch Street (7:15 to 9:15 pm) and Sunday mornings in Multnomah Village (8:30-10:00 am). The Chief Instructor of the Jodokai and Shindokai is Dan Pearson. A direct student of Kaminoda Sensei, Dan received Menkyo in Shindo Muso Ryu. Groups who practice Shindo Muso Ryu as taught by Kaminoda Sensei can be found in Milwaukee (the Go Daiko Jodokai led by Rich Friman); Denton, Texas (Jack Bieler); Houston, Texas (L.F. Wilkinson); Montreal (Réal Genest Sensei); North East Pennsylvania (Corey Comstock); Patrick Bannister (Savage, MD). Other affiliated instructors can be found in Michigan (Peter Boylan) and New York City (Deborah Klens Bigman). If you are interested in training in the Washington, D.C. or Portland, OR areas, or want information on how to train with these other groups, please feel free to contact us (email below).